The Dragon Boat Festival, otherwise also known as Duan-Wu Festival, is a celebration that originates from China. It is celebrated in remembrance of the life and death of a Chinese scholar named Qu Yuan. 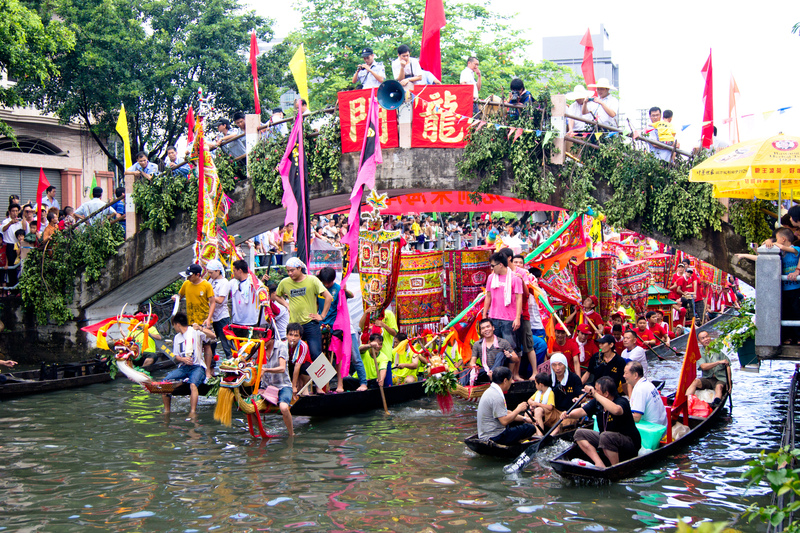 This festival occurs on the fifth day and fifth month of the Chinese lunisolar calendar and it’s often celebrated by eating rice dumplings (zongzi), drinking realgar wine (xionghuangjiu), a Chinese alcoholic drink made of fermented cereals mixed with powdered realgar and also dragon boat racing. The Dragon Boat Festival celebrated in China is usually filled with grandeur, apart from eating rice dumplings and joining dragon boat races, some people would also hang Zhong Kui on the doors of their homes, which is known to be a figure of a mythic guardian, calamus and mugwort, which are known to ward off evil spirits, and even take long walks or wear perfume pouches. Among the other interesting activities during the Dragon Boat Festival is to stand an egg on its end at noon time. This practice was regarded as an efficient way to ward off diseases, evil spirits and also promote good health. Chinese people also tend to wear talismans to protect themselves from evil spirits. Meanwhile, Duan-Wu is also known as “Poets’ Day” in the Republic of China to honour Qu Yuan, China’s first poet. The people would throw cooked rice wrapped in bamboo leaves into the river in the hope that the fishes would eat them and not the body of Qu Yuan who committed suicide by drowning himself in the Miluo River. Besides, the delicious food eaten during the festival is the steamed rice dumplings wrapped in bamboo or reed leaves and the fillings could include a mixture of eggs, beans, walnuts, mushroom and meat. On the other hand, the famous dragon boats are made of teak wood and are sculptured into various designs and sizes. Decorated with bright designs with the front part shaped like open-mouthed dragons and the back end a scaly tail, these boats could accommodate up to some 80 rowers, based on the length. Eyes are painted onto the boats in order to make them look “alive”. During the race, the first team that grabs the flag at the finishing point will be the winner. In Malaysia, the Dragon Boat Festival is also a fun celebration and people would participate in dragon boat races, prepare and indulge in rice dumplings during reunion dinners, hanging mugwort leaves on doors and wear perfume sachets to protect oneself against evil spirits and also insects.